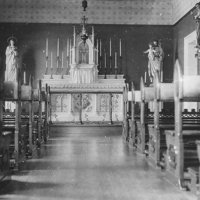 An image of what is likely the first or second edition of the chapel used by the Sisters in their convent on Second St in Hamilton. 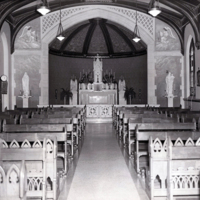 The convent was built across the street from St Joseph's church on Second St.
An image of what is likely identified as the renovated Hamilton chapel of 1925. An open house was offered to the public to inspect the new addition. 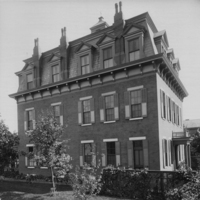 An image of the convent built for the Sisters on Second Street in Hamilton in 1873. 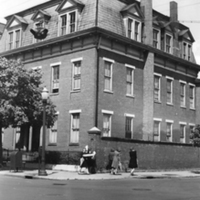 Previously, the Sisters lived in a rented house near the old Baltimore and Ohio depot on Fourth Street. 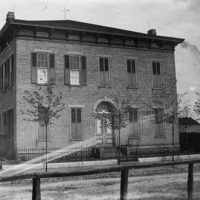 An image of the renovated convent that was damaged in a fire in 1891. 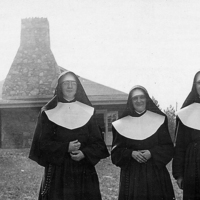 The Sisters were ready to add a new tin roof when they received permission to add a third story to the building. 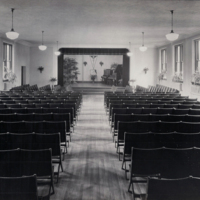 An image of the auditorium used by the students likely in the high school building built by 1925. 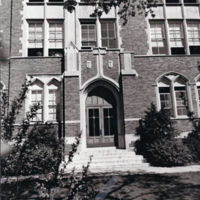 Soon after the school was established, it was known for having a strong music program and students would give performances for special occasions. An angled view of the front entrance to the high school in Hamilton. 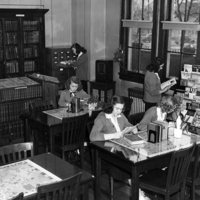 Students using the library in the high school in Hamilton. 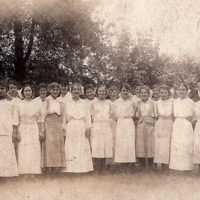 A photo of students in the 7th and 8th grade at Notre Dame Academy in 1915. 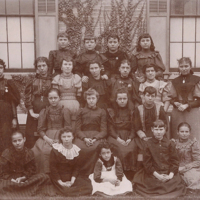 In 1915, the student population totaled 132 students and ranged from kindergarten to high school. A photo of the freshman class at the Notre Dame Academy in Hamilton in 1915. 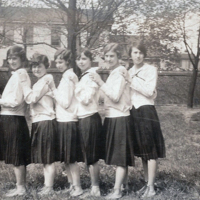 Sister Marian of the Sacred Heart was part of this freshman class and would enter the Sisters of Notre Dame de Namur order in 1931. Members of the freshman basketball team at Notre Dame High School in Hamilton. 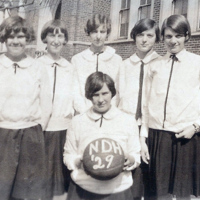 Members of the senior basketball team at Notre Dame High School in Hamilton. 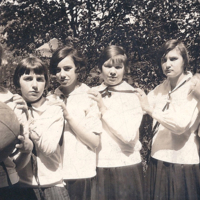 Members of the sophomore basketball team at Notre Dame High School in Hamilton in 1927. Three Sisters - Teresa, Ann Loretto, and unknown - ready for a summer outing in Hamilton around 1929. At that time, Sister Teresa taught 2nd Rhetoric at Notre Dame Academy and Sister Ann Loretto taught 3rd Grade boys and girls at St Mary's school. 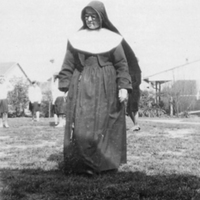 An image of Sister Superior Ignatius Loyola in the school yard at Notre Dame High School in Hamilton. 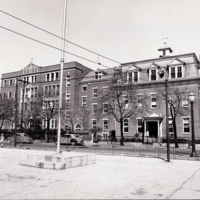 Sister Ignatius Loyola was Superior in Hamilton from 1928-1934. 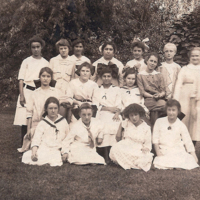 A photo of early students, around 1890, at Notre Dame Academy in Hamilton. 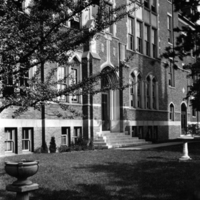 Although initially concerned about the low enrollment at the Academy, the Sisters soon saw increasing numbers and by 1901 would need an additional building. 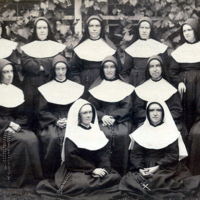 A photo of the Sisters and novitiates in the Hamilton community around 1888. 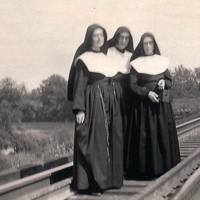 By 1888, the Sisters taught at St Joseph's, St Stephen's, the Notre Dame Day School or Academy, and St Mary's.